I stopped by the section dedicated to Singapore's First Chief Minister, David Saul Marshall (12 Mar 1908 ~ 31 Dec 1995) and it was here where I spent the most time during my earlier visit to the National Museum. Ask any Singaporean kid who were the founding fathers of modern Singapore and don't be surprised if their answers cannot go beyond Mr Lee Kuan Yew. Sadly, kids these days are under the impression that Singapore was built up single-handedly by our current Minister Mentor. Prominent names like Toh Chin Chye, Goh Keng Swee, Rajaratnam and even Kandasamy, just to named a few were unjustly cast into the shadows. Then we also have those that were not from the ruling party PAP. 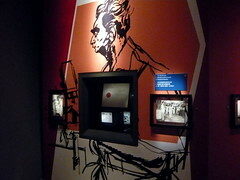 Names like Devan Nair and Lim Chin Siong, just to name a few as well fared worse as they shared even lesser of the Singapore history spotlight. 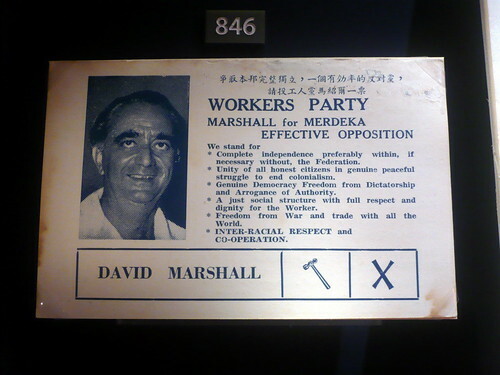 And then, there was David Marshall, who later moved on to set up the Worker's Party of today. Granted that challengers from the opposition parties have different philosophies, they nevertheless also approached policies in the interest of Singapore, albeit via a different perspective that is not agreeable to the PAP. In short, they were patriots too. The above picture shows a pamplet urging constituents to vote for David Marshall. Take clues from the pamphlet, I am guessing this is either for the 1959 General Elections where he lost in Cairnhill or the 1961 By-Elections where he won in Anson. Anyway, I studied what they "stood for" as printed in the pamphlet and three words caught my eye. Strangely how something that was drafted almost 50 years ago resonated in my heart half a century later over these 3 words. I believe I am not the only one out there feeling this. You know how sometimes you are able to smell the air to know that there is going to a drastic change in the weather? Well, I am starting to smell it. Afterthought: The elections are just around the corner and more and more people are getting jaded with the current gahmen and may be seeking alternatives to resolve that. Granted that PAP has done a great job for the country since day 1. From the days of being an abandoned child to that of a leading beacon in the region. Credit must not be taken away from them for all the work they have done. Still, the next vote that you cast should not be a token of appreciation for all that has been done. I can think of 3 million reasons too many, that we have already thanked them more than enough. The next vote is not for the past. It is for the future, based on what we see in the present. Problem is that I don't like what I am seeing right now. PAP should still return to power at the end of the day but the people will be introducing more opposition to trim away the unwanted fats and dead weights that has dragged the gahmen down over the years. It is time to clean up the house.